It is with excitement that I write to you this December. The holiday season is one full of friends, family, joy and hope for the New Year for many of us. I wish you all a safe and healthy month and a very happy and prosperous year to come. I do hope that during this holiday season we all take a minute to pause and remember those who may not have anyone to celebrate with or the means to do so with their family. There are many chances to help those who are less fortunate than us and I encourage everyone to seek out such an opportunity. The holiday season is a fitting time to come together and remember we are all one community and should support each other as such. Listening to a veteran’s story at RCL Branch 258 on Remembrance Day. November has certainly been a busy time but in particular I would like to highlight an important part of that month. In early November, there were Remembrance Day ceremonies across Scarborough. 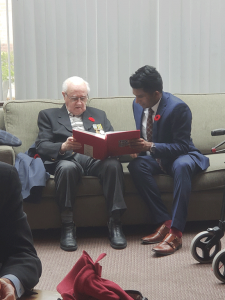 I was grateful to be able to attend ceremonies at the Scarborough Civic Centre, the Toronto Zoo, the Royal Canadian Legion, and the Tony Stacey Centre for Veterans Care to honour those men and women who have served in our Armed Forces as well as meet many of the veterans who came to remember their fallen comrades. Words simply cannot express the debt of gratitude that we all owe these brave soldiers who have fought to preserve our values and freedoms. Along the same theme of honouring our veterans, I had the privilege to plant a few trees as part of the Highway of Heroes Tree Campaign, which aims to make a living tribute to all who served by planting 2 million trees along the Highway of Heroes and the surrounding communities. I also had the privilege of attending many other significant and successful events in our riding. I was delighted to attend and award medals at the Ontario Open Judo Championships, which drew hundreds of competitors from around the world, while Wheelchair Basketball Canada’s signature fundraiser, Hoopfest, had a fun and inclusive 3-on-3 tournament. On a rainy and cold Nov. 1, many from our community braved the weather to attend the first Southeast Scarborough Pumpkin Parade where carving skills were on display while enjoying good conversation with neighbours. I also want to give special mention to FIRST Robotics Canada, which held their Open House in the Malvern community attracting kids and parents from the neighbourhood. This past month we had a constituency week where I got to meet with many residents and stakeholders. I want to highlight just a few in particular. I had a wonderful tour of the Malvern Family Resource Centre; I had the opportunity to meet with some of the management team at Legal Aid Ontario; and, on more of a fun note, I got the chance to tour the Toronto Zoo. These are all important organizations in our riding and I look forward to working with them further. I also had the opportunity to be in touch with many of our healthcare partners, including the team from the Scarborough and Rouge Hospital, and had an insightful tour of Providence Healthcare. Additionally, I met with some of the staff and volunteers from the Sexual Assault and Domestic Violence Care Centre and learned more about the important work they do in Scarborough. Before I sign off until next month, I did want to thank all members of the community who came out to the official opening of my Constituency Office and helped make it a success. 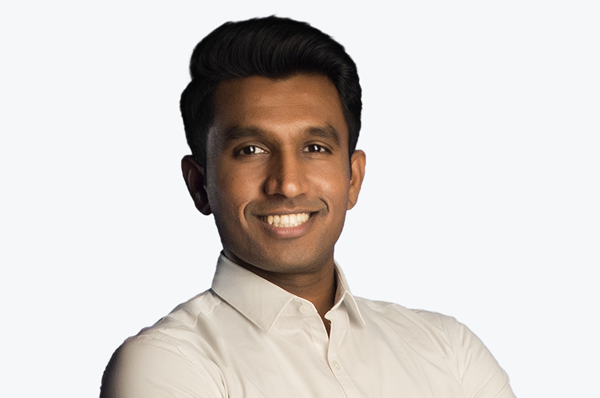 My office is here to help so please do get in touch to get assistance with any provincial matter or to set up an appointment to meet with me: 416-283-8448 or vijay.thanigasalamco@pc.ola.org.